Quality auto body shops are few and far between. At Moore's, the proof is in our history and service record. Serving the Baltimore area for over thirty years, this community continues to see us for what we are, a respectable, forthright shop that does right by the customer. Our repair technicians are certified by I-CAR - an industry training & testing organization. Any work they complete in our shop is guaranteed for the lifetime of your car or truck. We work with all insurance companies. In fact a large portion of our work comes from insurance claims. We process those claims, deal with the insurance companies on your behalf and get your vehicle back in the condition it was in before your accident. Our front office personnel are experts in handling these claims and making them as hassle free for the client as possible. We also have a large and loyal clientele that comes to shop for any and all personal vehicle repairs. We work directly with customers like you to make the high quality repairs your vehicle needs. Regardless of the make or model, whether it's a car or truck, or whether it's foreign or domestic, Moore's has the tools and know how to get the job done right. 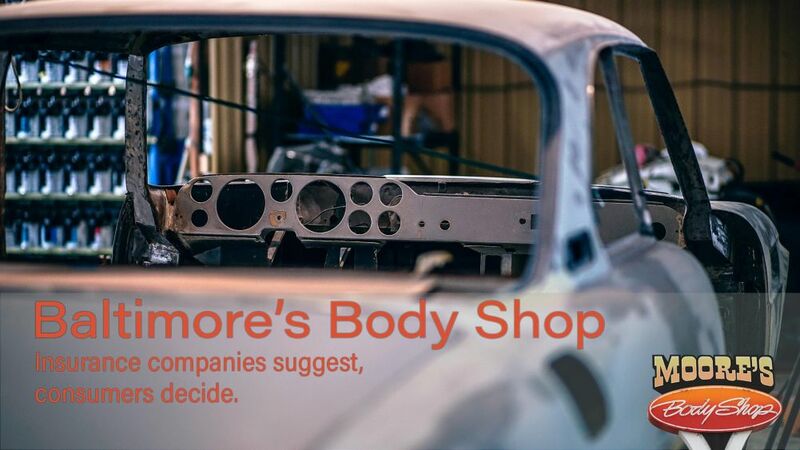 Call Moore's Body Shop today at 410-355-6232 for a free estimate, or browse our website for more information about Our Facilities or to see a Gallery of photos. If you have any other questions or comments, please contact us.